What's in a name? The Winchester Ranger is simply a modernized and marketing friendly version of the famous Black Talon bullets. Our 125 grain .357 Sig Winchester Ranger ammo packs all the performance and power of the original Black Talon ammo, but with the benefit of years of of technological refinement. The secret power of the Winchester Ranger is the unique hollowpoint system that uses a reverse taper bullet which devastatingly expands on impact, greatly increasing your stopping power. Delivering near .357 magnum performance- but out of a semi auto handgun. 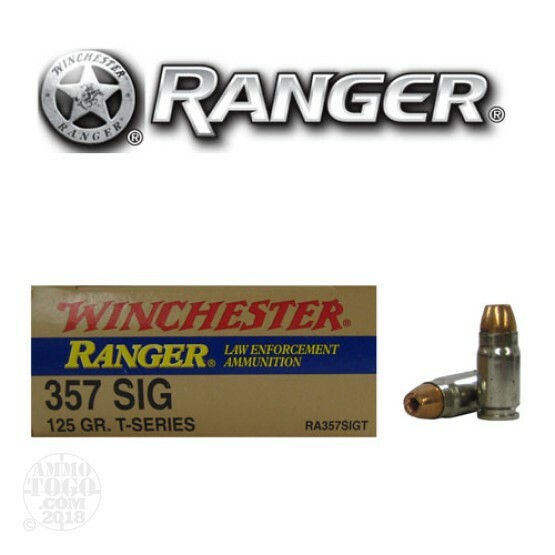 Winchester Ranger ammo is real world performing solution for self defense and duty needs. Packed fifty rounds per box, Winchester Ranger .357 Sig features nickel plated brass cases for easier function in a diverse range of pistols, a time and combat proven 125 grain expanding hollowpoint bullet, and an advertised velocity of 1345 feet per second out of a four inch barrel. This high quality ammo is hard to find on the commercial market, so we cannot guarantee a steady supply due to market demands. When available, take advantage of this rare opportunity to buy and use some of the finest .357 Sig ammo on the market!